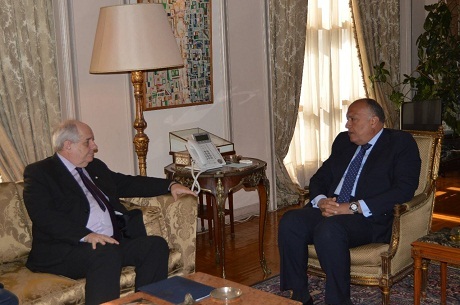 Egypt's Foreign Minister Sameh Shoukry on Saturday discussed with Greek Deputy Foreign Minister Terens Quick preparations for holding the third round of the Roots Revival initiative bringing together Egypt, Greece and Cyprus, to be held in Australia later in the year. During the meeting in Cairo, the two sides discussed means of boosting Egypt-Greek relations within the framework of friendship ties and strategic partnership. They also exchanged views about regional issues of mutual concern, foreign ministry spokesman Ahmed Hafez said in a statement. The first round of the initiative was held in Alexandria last April and the second in London in October, the spokesman said, noting that the initiative reflects the strength of historic and cultural relations among the three countries. The two sides also held consultations on Egypt’s chairmanship of the African Union in 2019 in light of the ministerial meeting that will bring together officials from the African Union and the European Union on 21-22 January.